All items are available for approval viewing. Scott #114, 1857 3c Ultramarine Locomotive, F-VF. Tied to 1871 cover by Boston datestamp. Sent to South Berwick, Maine. Original letter enclosed. Small part of lost in opening, but cover is otherwise VF. 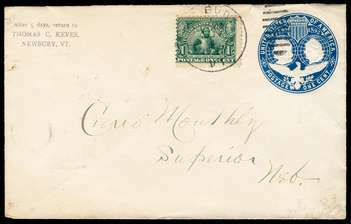 Scott #158, 1873 3c Green Washington on 1877 cover bearing nice Boston and New York R.P.O. cancel and bold "CARRIER" backstamp. Sent to Troy, New York NY. Nice early railway post office marking! Scott #184 [1879 3 cent green Washington, American Banknote, Soft Paper] (Fine) on 14 December ca.1879 cover from ALBANY, New York. Brilliant yellow envelope; very striking. Scott #207, 3c Blue Green Washington, F-VF. Tied to advertising cover from Mass. Agricultural College Nursery, J.W. Clark, Supt. by light North Amherst, Ms. duplex cancel. 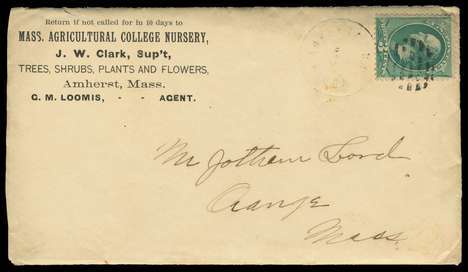 Enclosing an 1882 note on letterhead and a catalog of Nursery stock. Cover has minor mounting residue on back. Massachusetts Agricultural College became Mass. State in 1932. Clark Hall, the Horticultural Building, was named after Supt. J.W. Clark. 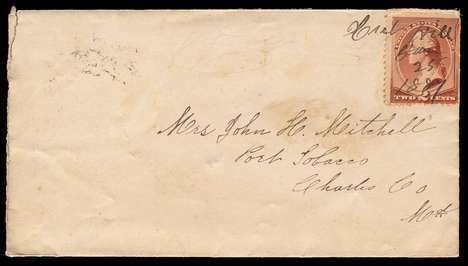 Scott #U273 [1884 2 cent brown on white paper Washington (round O in TWO) envelope] Used with VF appearance on front. Backside with aging. From JAMAICA, NY, May 2, to NYC, with 1884 receiver. 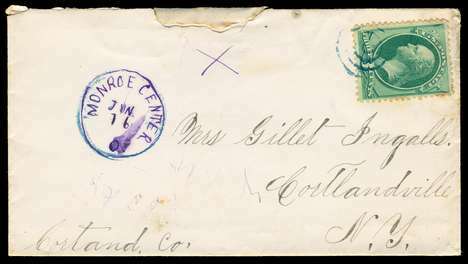 Very scarce envelope entire. (Scott 2015 $190 for entire.) The May 2, 1884, date is a month earlier than the "June 1884" date noted in stock. This may be an earliest known use? The die characteristics do match exactly with all features of Scott #U273 (image type U65) . 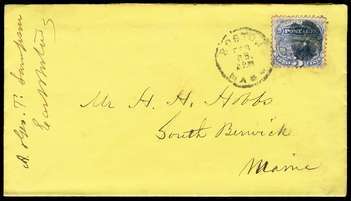 210 (defective) on January 25 1887 cover with manuscript cancellation "Cub Hill / Jan 25 1887" (Baltimore County). Very neat and attractive, with contents. 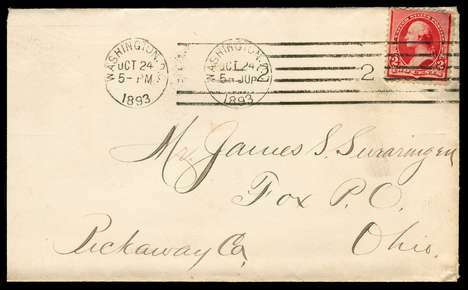 Maryland postal history is popular and manuscript cancellations (i.e. from very small post offices) from this late date are unusual. With contents, a neatly written personal chatty letter. Scott #210 [1883 2c Red Brown Washington] extremely damaged on 16 January 1887 cover from the "House of Representatives U.S." containing a complete handwritten letter from U.S. Representative (from New York 15th district) Henry Bacon to H.W. Chadeaque of Cornwall, New York. The Washington postmark is likely of a type used for Congressional mail. 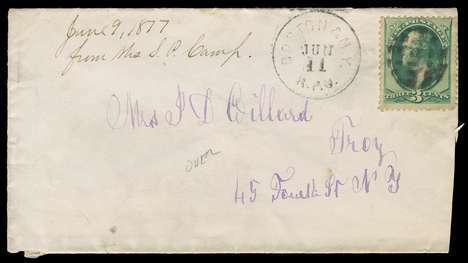 The reverse of the envelope bears a fancy scalloped blue oval receiving postmark "CORNWALL / Orange Co., N.Y. / Rec. JAN 17". The letter appears to be addressing a complaint from a constituent in regard to postal matters, apparently unsatisfactory mail carrier service. The letter is signed by Henry Bacon -- the signature matches known examples. There is a discoloration in the corner containing the signature (and the envelope was affected also), however, online autograph dealers offer this signature (undated, not on a full letter) at $170! 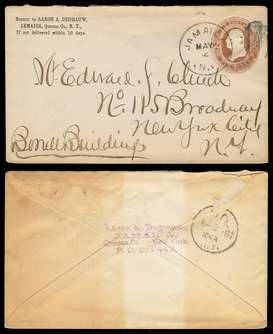 The primary value is that of the autograph, however, the receiver postmark may be scarce as well. Scott #220c, 1890 2c Carmine Washington with cap on both "2". Fine. 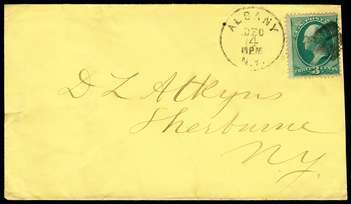 Tied to VF 1893 cover from Washington to Ohio. Circleville backstamp. (Scott 2013 $32.50 off cover.) From the J.A. Farrington collection. Scott #305, 1903 6c Claret Garfield, F-VF. 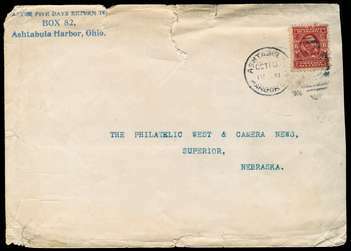 Tied to 1906 cover from Ashtabula Harbor, Ohio, to Superior, Nebraska, with backstamp. Cover has edge tears, fine appearance. This stamp is rather unusual as a single franking! Scott #U348, 1c Blue Columbian Exposition postal stationery envelope entire, upfranked with Scott #328, 1c Green Jamestown (Average), used in 1907 from Newbury, Vermont, to Superior, Nebraska, with backstamp. Flap has a small tear from opening, but otherwise F-VF. A very unusual franking combination! 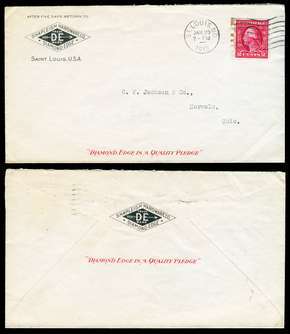 Scott #344 [1908 2c Carmine Washington] (VF) with Shermack Type III vending perforations, tied to July 15 1910 cover from Chicago, Illinois to Wonewoc, Wisconsin. Excellent machine cancellation. 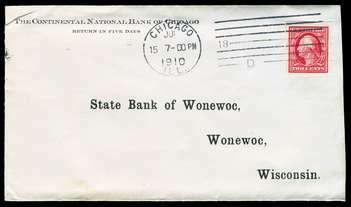 The cover bears the return address of Continental National Bank and contains a bank "cash letter" enclosure. The stamp has large margins and the perforations all clear the design (unusual). (Scott 2019 $22.50.) Outstanding example. 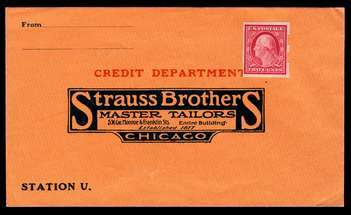 Scott #344 (or #384) [1908 2c Carmine Washington] (VF) with Shermack Type III vending perforations, unused on reply advertising envelope addressed to Strauss Brothers Master Tailors of Chicago, Illinois. The stamp has large margins with the usual one-sided perforations. Very attractive and not often seen on an unused reply envelope. Scott #409 [1912 2c Carmine Washington, Type I] (Superb) with Shermack Type III vending perforations, tied to September 13, 1912 cover (window envelope, but with addressed contents) from Boston, Massachusetts to Natick, Massachusetts. Excellent Boston flag machine cancellation. 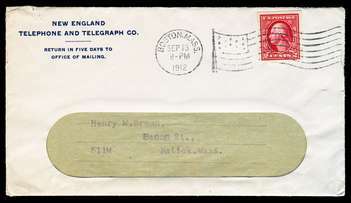 The cover bears the return address of New England Telephone and Telegraph Company and contains a statement of account for phone service. The stamp has very large, even margins, and the perforations all clear the design (unusual) and wonderfully centered. Inconsequential small opening tear at top, away from stamp. (Scott 2019 $25.00.) Outstanding example. Scott #409 [1912 2c Carmine Washington, Type I] (VF) with Mailometer Type IV vending perforations, tied to January 23 1915 cover from St. Louis, Missouri to Norwalk, Ohio. The cover bears advertising front and back with the Shapleigh Hardware Company "Diamond Edge" trademark symbol. Stamp has adhesive marks in the left margin; I believe that this was a single from a paste-up and that the adhesive remains from the next stamp. (Scott 2019 $40.) Very attractive, with large margins and excellent perforations.